Supplier organizations are hungry for clear and concise guidance around developing processes to ensure customers can easily place orders, products and services are delivered on time, invoices are submitted efficiently, and invoices are approved and paid quickly. 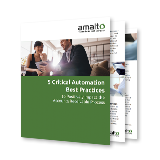 To help companies move toward higher performance in these areas, Amalto Technologies, the leader in Order-to-Cash, logistics and field data management, today published its new eBook 5 Critical Automation Best Practices to Positively Impact the Accounts Receivable Process. This eBook takes a deeper look at areas that organizations can optimize around order management, invoice submission, and Accounts Receivable. This eBook will help organizations understand the keys to automating customer engagement, product delivery, invoice delivery and payment. In addition, Accounts Receivable and Order-to-Cash professionals will better understand portal and third-party network management as well as overall financial system integration. The free eBook can be downloaded here or by visiting the Amalto website at https://www.amalto.com/.